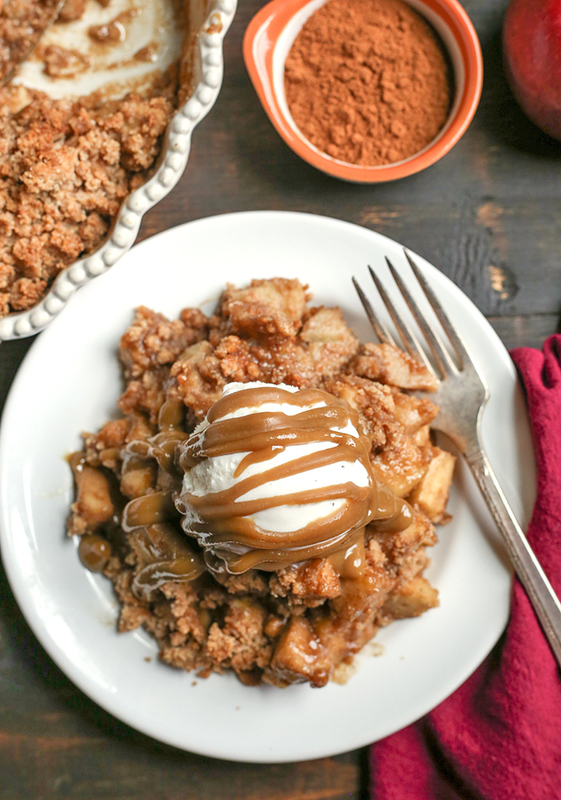 This Paleo Vegan Caramel Apple Crisp is the perfect fall treat! 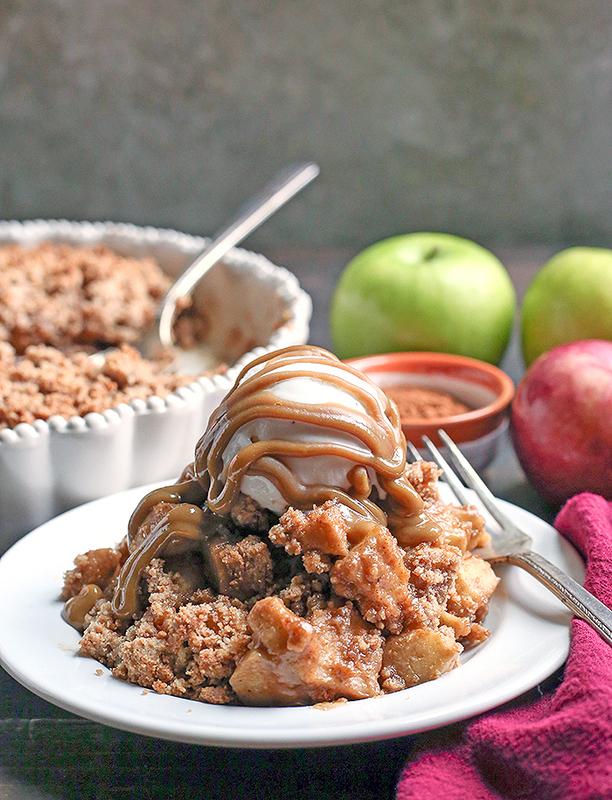 A simple caramel mixed together with the apples and topped with an irresistible crumb topping. 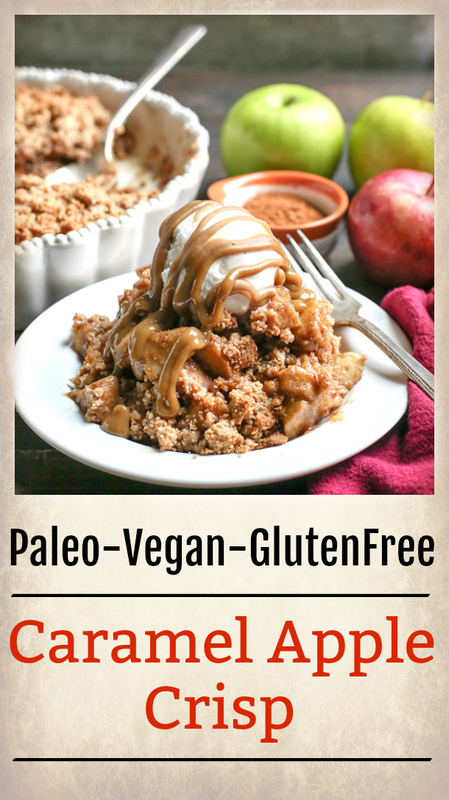 Perfect with a scoop of dairy free ice cream and more caramel! It’s gluten free, dairy free, and naturally sweetened. OMG is this apple crisp amazing! I could not quit eating it and I promise no one will be able to tell it’s healthy. 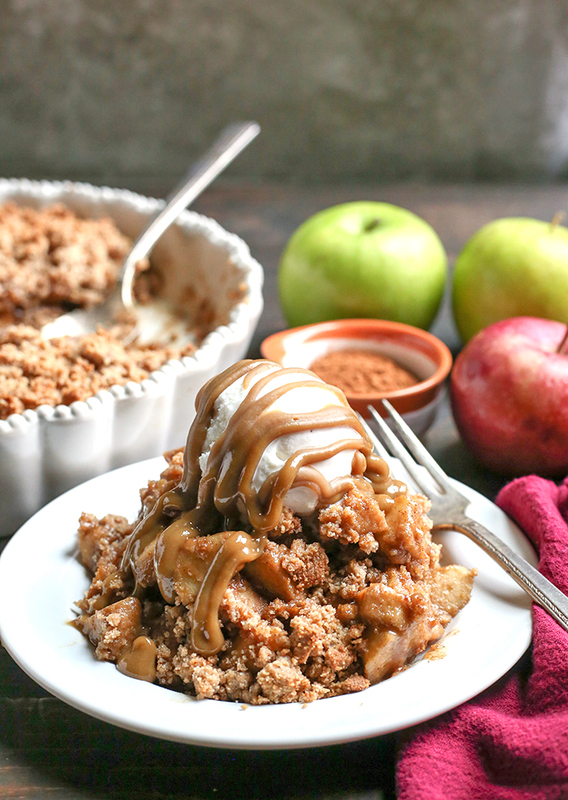 Apple desserts are definitely one of my favorite things about fall, this one included! Look at that caramel apple goodness. I ate more than I want to admit of this mixture. When I took a poll on Instagram if people wanted caramel apples or caramel apple crisp- this won by a landslide. I knew I still wanted to keep it easy though and that’s where the caramel comes in. I’ve been making a “cheater” caramel for years with almond butter, coconut oil, and maple syrup. 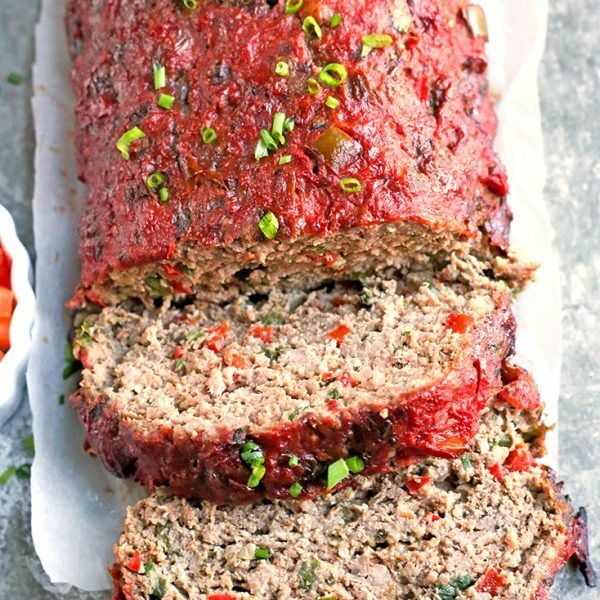 It’s easy, doesn’t require any cooking and you probably have all the ingredients already. I decided to try it with SunButter and it came out better than I imagined. The consistency is evenly smoother and it truly tastes like caramel. I could eat it by itself it’s so good. This is how I will be making it from now on! If you’re not familiar with No Sugar Added SunButter, it’s only 2 ingredients (roasted sunflower seeds and salt) and so creamy. I made some extra caramel for drizzling over the crisp once it was done and I highly recommend you doing the same. It would also be perfect used as a dip for apples. The crumb topping is pretty important- am I right? I mean, it is apple CRISP. I used a tried and true topping from one of my coffee cakes and it worked great. You could add some chopped nuts if you’d like, or leave it as is. 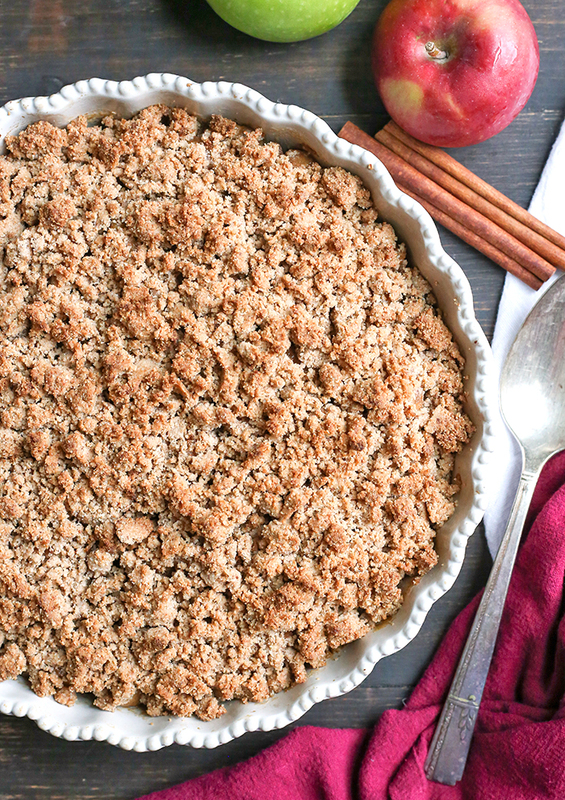 The apples get soft, but still have a little crunch, the caramel pairs perfectly with them, and the crumb topping adds nice texture. HERE is some vanilla ice cream you could serve on top. 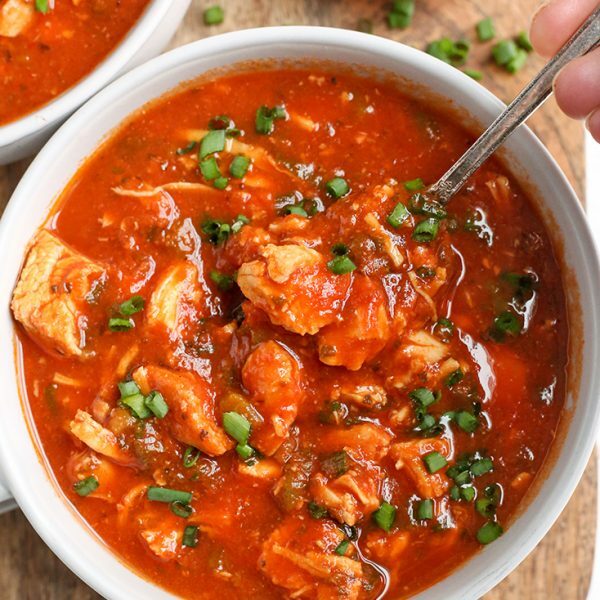 If you are looking for an easy, delicious fall treat, this is it! I know you will not be disappointed. Preheat oven to 350° and grease a 9 inch square pan or deep dish pie plate. Set aside. Place apples in a large bowl. In a medium measuring cup or bowl, combine coconut oil, maple syrup, SunButter, and vanilla. Stir until smooth. Pour mixture over apples and coat well. Dump apples into prepared dish. Make the crumb topping: In a medium bowl combine almond flour, coconut flour, coconut sugar, ghee, cinnamon, and salt. Mix well until combined and crumbly. Sprinkle mixture over the apples as evenly as possible. Bake 28-30 minutes until top is lightly brown. Serve as desired, but very good warm! Top with additional caramel if you want. *For more caramel topping, mix 1/4 cup melted coconut oil, 1/4 cup maple syrup, 1/3 cup SunButter and 1 teaspoon vanilla together. Store in fridge and rewarm as needed. 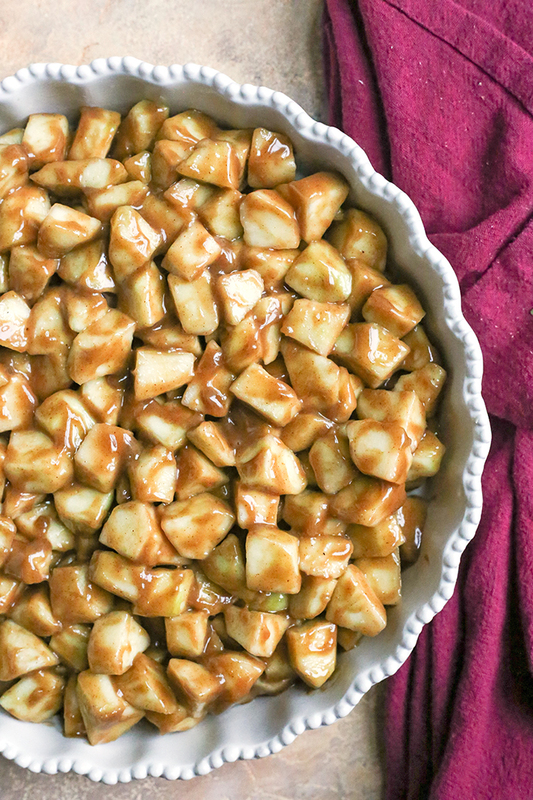 Do you have a recipe for the caramel you drizzled over the top? Hi Patricia- I just updated it in the notes. It’s the same as the caramel sauce for the apples. Hope you try it! Hi Tannis- you could use ghee or possibly coconut butter. I don’t know if that helps, let me know if you have more questions. Thanks! Should there be oil or butter added to the crumb topping ingredients? Yes, thank you for catching that! Thanks, Stacie 🙂 Now updated. 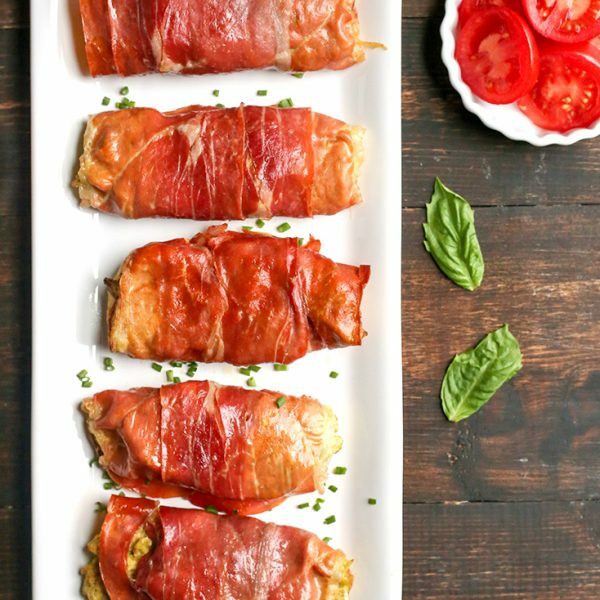 What do you think about using peaches with this recipe?? Or do you have a paleo dessert with a peaches? 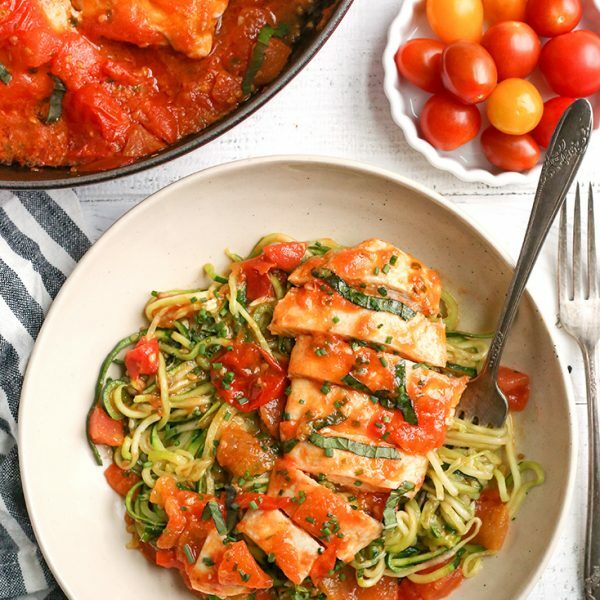 Hi Andrea- I think that would be delicious! I don’t have any peach recipes on my site currently. 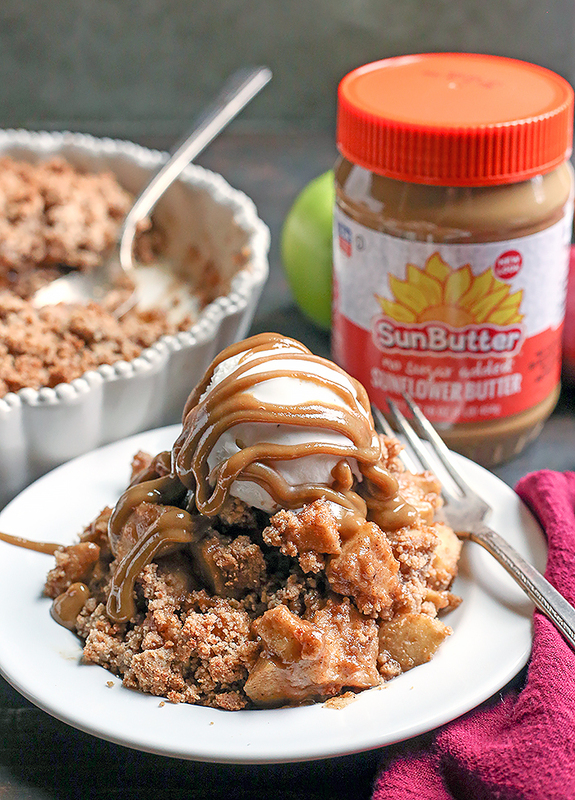 What’s a sub for sun nut butter? Any but butter? Hi Debra- yes, any nut butter will work. Enjoy!